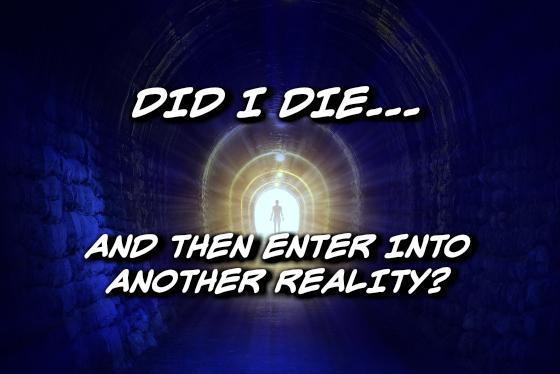 Did I Die...and Then Enter Into Another Reality? “When I was 10 years old I experienced something extremely abnormal, strange, weird, all of those things put together. I don't know if this is a 'Mandela Effect.' I don't know if this is just a time slip, but I'm hoping that by sharing my experience maybe you could shed some light for me because again I'm ignorant to the 'Mandela Effect.' The really good thing is I actually have my best friend who witnessed this as well, so it kind of validates the fact that I'm not crazy. Here we go. Please help me. I think I died. I don't know exactly what happened. My best friend lived directly behind me. We met when she was playing the recorder and I was playing my record in the backyard and then we kind of like, 'Hey, let's be best friends' because it's really easy to make friends when you're kid; not so much now. So we were jumping on her trampoline and I'd never really jumped on a trampoline before, you know. I was that kid that kind of always got hurt really easily, so I didn't really do a lot of active things. As I was jumping, I went really high, so high in fact, that I could see over her rooftop. It was amazing. And by the second jump where I could see over the roof, I realized I'm really, really up high. So I came back down a bit. I was going with such a force I couldn't quite slow down, you know, it takes a few jumps to kind of slow down. So I went up and somehow I accidentally flipped forward so I'm now hurtling towards the ground. Bum up, feet up in the air, head down and my hands like out in front of me. So during that flip, I had kind of moved to the side so I was falling towards the ground, like I wasn't going to land on the trampoline, I was gonna go to the ground. Literally, my feet were up in the air, my hands were like in front, so I had that moment of absolute horror and I just knew that was it. I thought I was gonna be paralyzed from the neck down or I was gonna die because I would have broken my neck. So I closed my eyes really tight and I screamed and then there was just silence. I got goosebumps because this is really weird. There was just silence. I felt nothing. Suddenly I was kind of bouncing like really slowly, you know, when, you're just kind of resting on a trampoline and you're bouncing so I open my eyes...and I'm standing upright looking at my best friend and I'm just bouncing. Okay, this is me falling (upside down). This is me, suddenly, boom (standing straight up). I time-traveled. I'm Marty McFly, maybe? Maybe not? There's no logical explanation how I can be this far from the ground (mere inches). I kid you not, my hands with this far from the ground (inches) and then I am suddenly on the trampoline, upright, bouncing, like nothing had happened. And that my friend saw me, just appear and I looked around and I was really confused because I felt like this whole moment in time had just disappeared. And she just stares at me and she says, 'Whoa, you okay? And I said, 'What did you see?' and she said, 'I don't know,' she said, 'You were falling and then,' she said, 'And then within like a split second, I was standing upright.' Now that doesn't make sense to me.